NuVu Studio takes high school students out of the classroom and into a design space to invent and create. 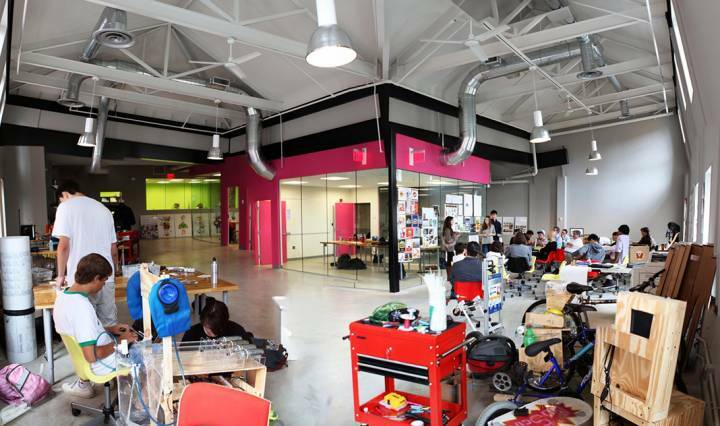 Down an alley off Massachusetts Ave. in Cambridge, there’s a “maker space” called NuVu Studio, where local high school students leave their classrooms behind to design robots, websites, board games, medical devices, and clothing, among other things. But they’re not playing hooky — in fact, it’s part of their education. The brainchild of MIT alumnus Saeed Arida PhD ’10, NuVu (pronounced “new view”) enrolls students from local schools — both during the academic year and the summer — to focus on real-world projects. In so doing, they’re exposed to the collaborative, experimental, and demanding design process typical of architectural design studios. “We walk students through a rigorous process to get to this real, final product,” says Arida, who modeled NuVu after design studios in MIT’s School of Architecture and Planning, where he studied design and computation and taught several studios.